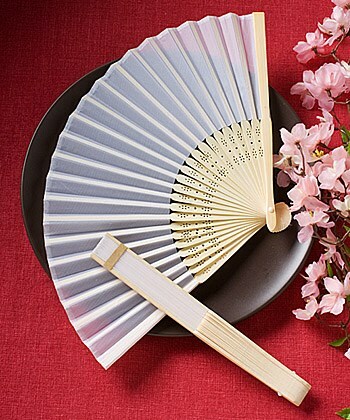 Your family and friends are sure to be big fans of these elegant silk fans favours. A pretty and useful choice as destination favours, beach themed favours, or favours for summer events, these fans are silky sensations that can also add some distinctly Asian flair to your day. Something that your guests are sure to use time and time again, each 8.25" favour features a collapsible/expandable construction that opens to reveal a delicate white silk fan on a sturdy light colored wood frame. The wood ribbing has an intricate cutout design. Compact when folded and a breath of fresh air when opened, each exquisite silk folding fan favour comes in a white box.